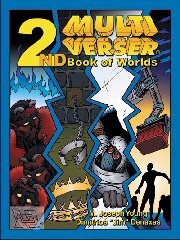 The eagerly awaited sequel to The First Book of Worlds, this book exceeded expectations according to the critics. Willard Bowzer wrote, "Overall the product shines....In a word: Brilliant". Breton Stron echoed, "this book is 1000% better." He goes on to say, "these could even be great world ideas beyond the Multiverser system" and calls the book "one of those rare gems in role-playing where the second in a series outdoes the first." Again, it begins with a gather world, a place with lots of possibilities, where many players can be brought together into one place and either work together or find their own goals and objectives. Again this one is very alien. Bah Ke'gehn is a masterpiece of misdirection, a world which at every turn has all the trappings of hell, yet the demonic-looking locals are in some ways more humane than humans. E. R. Jones found them to be the most alien beings he had encountered in all his gaming and reading, yet they are ultimately playable, comprehensible to the average gamer, once who they are is understood. The potential for player character confusion here is complicated by the fact that to the locals, he looks like their myths of demons; that in this world magic is normal and technology is feared; and that there are a few other humans here who are quite certain (and incorrect) of where they are. Prisoner of Zenda is the classic book in which the hero has to be the substitute for the king while striving to rescue the hostage king from his evil half-brother. Combining elements of the book with various translations to the screen, this version provides an ultimately playable adventure in which the player character is the duplicate, and faces the difficult choices presented to the hero. Again there is one world which is two in one. This time, the worlds look quite the same on the surface, quiet agrarian societies with pre-gunpowder levels of technology which welcome the player character readily. In one of these, however, a misstep is likely to have the character tried for witchcraft, and burned at the stake to attempt to save his soul. In the other, there is no threat of that; but there is a threat. Alien space ships have been scouting the planet, reported by the locals as apparitions, demons, and signs in the skies, and when they invade only the player character understands what they are and how to stop them. The New Ice Age is a survival setting, earth as it might be were it not for global warming keeping the frozen wastes at bay. There's much here on techniques for living in such a setting. Grover Penn reviewed this world when it was a free download from Valdron, giving it a five out of five for substance and suggesting that it should be in this book. It's been expanded with more on human settlements particularly, and here it is. Survival of the fittest, taken as a religious doctrine, could make a significant difference in the world. If the world took it seriously, it might wind up looking very like Post-Sympathetic Man, a world in which human competition for power, wealth, and breeding rights has been not tempered but driven by modern levels of technology. Even the player character who does not throw himself into the competition to survive and prosper may find himself dragged into the fray by those seeking advantage. The post-apocalyptic scenario is always popular in gaming circles. Here's one without the apocalypse: the world dies not with a bang, but with a whimper. As mankind gives all its labor to machines and its land to agriculture, moving into leisurely lives in underground complexes connected by automated subways, it loses all understanding of the world in which it exists. The machines become the gods, and those who can still direct them through the correct ritual sequence of button-pushing are the priests. However, even utopia cannot last forever, and the control systems of the world may be on the verge of collapse. The player character may have to save humanity from its new destruction. If you've been to the time travel section, perhaps you've read my short story, The Perpetual Barbecue. There's a story behind the story. Originally, the world was conceived as a Multiverser world, and I put together a few concepts as a framework. Then, being burdened with other concerns, I asked John David Walker if he'd be interested in fleshing it out, and he started throwing some ideas into the mix--but family concerns pulled him off the project, just as I put together that story (published originally on the now defunct RPG Review site). Then I picked up the torch, and used the story as the framework to complete the world. The player character enters the scene on the morning of the picnic; but every day seems to be the morning of the picnic, and remains so until he can figure out why and undo the problem. To complicate matters, the day alternates between the most wonderful picnic in memory and an unmitigated disaster in which several people die in tragic accidents. Further, this has a contingent setting: if the character manages to save the world, it will show its appreciation by arresting him and investigating who he is and what he's doing. If he manages to get past that, he may become part of experiments in the latest technological advances in matter transmission. As you can see, there's material here you won't get anywhere else. You can order this from Valdron Inc for $22.95 (shipping paid in the U.S.), by mail or by credit card through CCNow (this link will add this product to a shopping cart) or PayPal (this link will connect you with PayPal to provide credit card payment information).